Napa means Cabernet and Chardonnay. But despite high rents, these producers are taking chances with offbeat grapes to make a different kind of Napa wine. It’s important to have heroes who are willing to stick up for the underdog. Whether it’s sports, politics or wine, the champions of underserved causes help ensure diversity and interest. In Napa Valley wine circles, this means tending to varieties less obvious than Cabernet Sauvignon, even when it doesn’t pencil out on paper or resonate with the popular consciousness. Our heroes of unsung grapes are growers and winemakers. They’re champions of something different, beating the drum for their cause over generations, decades or just a few years. 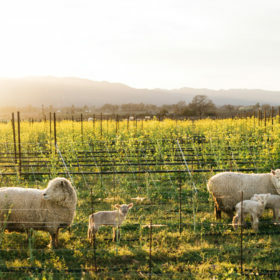 They show us that there’s more to Napa Valley than one might assume, and that ultimately, if it grows well and tastes good, adoration will follow. Doug Shafer and Elias Fernandez began to make wine together in 1984 at Shafer Vineyards, where they remain a successful team. But they yearned for that sense of adrenaline and adventure they’d felt in those early days. So they launched Eighty Four Wines to reach beyond the usual Napa Valley varieties. They began with Petite Sirah, Malbec and Albariño, planting four acres of the latter in Carneros in 2012, and releasing their first vintage of Albariño in 2015. The duo planted the Albariño in the same vineyard where they’ve grown Chardonnay for Shafer since the early 1990s. They believe that both varieties have the same requirements: a long, cool growing season and heavy clay soils, which hold vine growth in check and endow the fruit with beautiful aromatics and layers of exotic flavors. “High acidity, great minerality in the mouth and a citrus perfume aroma [are] hallmarks the variety,” says Fernandez. He admits that it’s tempting to focus only on Cabernet Sauvignon in the Napa Valley. “I don’t think I’ll ever get to the point where I feel as a winemaker I’ve ‘mastered’ Cabernet Sauvignon,” he says. “My 32 vintages of making wine here have all been different. But being a one-trick pony isn’t the way to go. Fernandez knows the history of the Napa Valley is rooted in trying new things. “I’ve lived in Napa Valley all my life, and I knew a lot of old timers who grew grapes and made wine long before me,” he says. “If there’s anything I’ve seen, it’s that you can count on change. Eighty Four 2016 Albariño (Napa Valley); $28, 94 points. This strengthens the argument that there’s a place for different kinds of white wines in the Napa Valley, emphasizing fruit freshness and acidity without sacrifice to flavor or soul. Juicy apricot and green apple ride a wave of unoaked refreshment and refinement, all within a crisp framework of deliciousness. Lavender and honeysuckle seduce quietly. Winemaker John Skupny worked at Caymus, Clos du Val and Niebaum-Coppola (now Inglenook) before he founded Lang & Reed Wine Company in 1996 with his wife, Tracey. His focus was on Cabernet Franc in the Napa Valley, as he took inspiration from the Cab Francs of the Loire Valley and Bordeaux. They’ve never wavered from that vision. “Though probably not the first, Robert Mondavi began utilizing Cabernet Franc when creating his first Reserve and Unfiltered bottlings in 1966,” he says. But, Skupny says, most winemakers avoided Cabernet Franc because of its supposed propensity to show green bell-pepper notes. He loves that Cabernet Franc is comfortable and expressive in a broad range of regions, from Bordeaux and the Loire to Friuli, Tuscany, Washington State, South Africa and, of course, California. At Lang & Reed, he takes a “less is more” approach to the variety. Skupny coaxes it to express floral violet and high-toned fruit like cherry and raspberry, complemented by accents of dried herb and slight, earthy aromas of mushroom and sous bois. Lang & Reed 2013 Two-Fourteen Cabernet Franc (Napa Valley); $48, 91 points. Named for a Loire Valley clone, this New World wine achieves an Old World sensibility with its floral invitation and bright, peppery overtones. Coiled within its thickness of tannin and dense cherry are ethereal, earthy whispers of intrigue and acidity. This is a lively, lovely wine. Brought to the Napa Valley from Savoie in the French Alps during the 1880s, Charbono (widely planted as Bonarda in Argentina) is an endangered species in California. There’s less than 100 acres of the grape thought to exist in the state, half of that in Napa. Much of its history here can be traced to Inglenook, which used it both as a blender and a varietal wine. A taste of the 1968 Inglenook Charbono inspired a 16-year-old Bob Foley, of Robert Foley Vineyards, to become a winemaker. He says it was never a prevalent grape in the Napa Valley, and it was seldom even included in “mixed black” field blends. “Charbono was grown in its own separate blocks, because of its atypical ripening pattern as compared with other Vitis vinifera varieties,” says Foley. Dark as night and with a taste like blueberry pie, it has a small but passionate fan base. A few tenacious growers tend it, like Jim Frediani, whose family has grown Charbono since the 1930s, and Vince Tofanelli, who has sold Charbono grapes to Inglenook, Turley and for The Prisoner wines. Robert Foley 2914 Charbono (Napa Valley); $38, 90 points. Leather, black pepper and fresh compost shock the nose in a wine that’s fruit-shy at the outset. It’s light bodied, bright in acidity and offers refreshing minerality. Cinnamon and vanilla season the subtle blackberry and raspberry flavors. When Donn and Molly Chappellet bought property on Pritchard Hill during the mid-1960s, Donn’s focus was on hillside Cabernet Sauvignon. There was Cabernet planted on the land when they arrived, along with Napa Gamay, Riesling, Chardonnay and Chenin Blanc. The plan was to eventually take out the Chenin and plant more red grapes. The couple made use of what they had, however, and crushed their grapes at Robert Mondavi Winery under the watchful eye of Mondavi himself. Their Chenin Blanc was different. After the first few vintages, it found a following. Not coincidentally, the Chappellets were no longer in a hurry to take out the vines. What their customers fell in love with mirrored what Molly loves as well: a floral honeysuckle character buoyed by stone fruit and citrus that gives the mouthwatering wine a singular brightness. After some 40 years, the vines decreased in productivity and had to be taken out. The last vintage from those vines was 2004. The land was replanted to Bordeaux varieties. Yet, the Chappellets kept hearing from Chenin fans asking how they could live without it. So three acres of Chenin Blanc were planted again at Chappellet, and the resurrection was completed with the 2009 vintage. Molly’s signature is on every bottle, in honor of her persistence. Chappellet 2014 Signature Chenin Blanc (Napa Valley); $32, 94 points. This is such a lovely, well composed and deliciously enjoyable wine that it might induce tears of happiness—that’s how good it is. Apricot, vanilla and cream surround a rounded, smooth lushness spiked with nutmeg and tea. Editors Choice. This husband and wife are heroes of many unsung grapes, both on their property and as caretakers of other vineyards across the valley. Horticulturalists at heart, they love to see how different things grow and the challenges they present. That philosophy guides them in the garden, where they plant different types of tomatoes, eggplants, peppers and beans. They like the differing flavors that each variety provides, which help guide their cooking. They also nurture fruit orchards and make jam to sell at the farmers market and to local restaurants. The Matthiassons make varietal Ribolla Gialla, Refosco, Schioppettino and Cabernet Franc wines from their home vineyard. They produce their Ribolla Gialla in the traditional way, fermented in contact with the skins so it becomes an orange wine. While the wines are all delicious, that doesn’t mean they’re easy to commercialize. So why produce these less obvious wines? Ultimately, the couple does it because they love it. They’d find it boring to just make two or three varietal wines. Matthiasson 2014 White Blend (Napa Valley); $40, 92 points. Crisp, refreshing and uniquely spicy and mineral-driven, this blends 50% Sauvignon blanc, 25% Ribolla Gialla, 20% Sémillon and 5% Tocai Friulano, all unusual varieties in the Napa Valley. Light, bright and fleshy, it tastes of lemon, mango and the sea. Fred and Eleanor McCrea established Stony Hill in 1943. They planted their first vines in 1948, beginning with Riesling, Chardonnay and Pinot Blanc. They soon added Gewürztraminer and Sémillon. The family still makes Riesling from these original vines. The founders’ granddaughter, Sarah, works with her parents, Peter and Willinda, to keep the dream alive, alongside the longtime winemaker, Mike Chelini. Sarah believes that Napa Valley benefits from being thought of as a place that produces great wines, not just great Cabernet Sauvignon. Stony Hill Riesling thrives on an eastern-facing hill that’s steep and adjacent to a tall forest. The vines are terraced north to south, which allows them to receive sun in the morning, and provides shade during the hotter parts of the day. They head-train the vines to create a larger canopy and orient that canopy to protect the clusters from direct sunlight. The Riesling grapes are usually the last of the whites to be picked at Stony Hill, yet they retain the lowest sugar and pH levels. Interest in Stony Hill’s Riesling is growing, driven by the sommelier community, Sarah says. That has helped familiarize customers with the grape’s many great qualities. Stony Hill 2015 White Riesling (Napa Valley); $30, 94 points. From a combination of estate, dry-farmed fruit, first planted in 1948, and grapes sourced in Carneros, this lovely white is fermented in stainless steel, which coaxes a seamless, light-bodied crispness on the palate. Exotic white peach and briny stone highlight a heady aromatic thread of honeysuckle, ginger and wild vanilla.